JAL brings back Birthday discount and upgrade. Image by Japan Airlines. The popular birthday sale for domestic tickets is back! 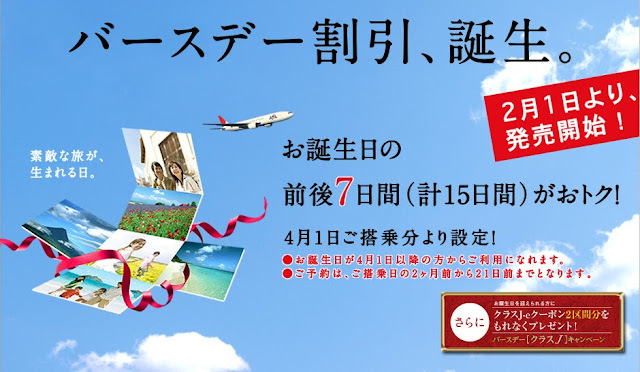 Japan Airlines will bring back this once popular birthday promotion from April 1 2010. On top of that, JAL is running a birthday upgrade to domestic Class J promotion for JMB Japan members. Tickets sale begins on February 1 2010! For details, you can refer to JAL website (Japanese only). For JMB Japan members, JAL will give you two domestic Class J e-coupons during your birthday month. But you have to register in advance to take advantage of this offer. You can only register two months in advanced and the last day to register is the end of your birthday month, i.e. JAL is accepting registrations from JMB Japan members whose birthdays are in January, February, and March. The e-coupon will be credited to your JMB account in batches. Members register between 1st and 10th will receive their e-coupons at around 20th. Members register between 11th and 20th will receive their e-coupons at around the end of the month. Members who registered between 21st and the end of the month will receive their e-coupons at around 10th of the next month. The e-coupons will expire at the end of the month following your birthday. And the e-coupons are transferrable relatives who are eligible for your award redemption, i.e. up to second-degree relatives. For details of the birthday upgrade promotion, you can refer to JAL website (Japanese only). Lucky JMB Japan members. I wish I have similar promotions in the US!